The award winning Wölvhammers have shipped and are arriving at dealers ready for the winter season. This year's boot has seen some small revisions to keep you riding all winter long. The soul of the 2015 Wölvhammer is 20% wider for a better, more comfortable fit. We've also removed the toe spike option to reduce conductive heat lose through metal under the foot. 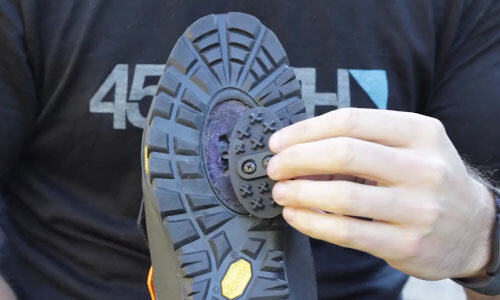 For 2015, one shoe covers both SPD and Flat Pedal users with a removable cleat cover. Keep the cover on and ride on flats; remove the cover, mount your 2-bolt SPD cleat, clip in, and ride. We've also updated the upper with 1680 denier ballistic nylon and upgraded the insulation to 200g Primaloft® for added warmth and moisture resistance. These small updates help to keep you even more comfortable in your winter pursuits. Don't let winter hold you back - get out and enjoy the ride! Wölvhammers will be available at stocking dealers in late October.